Parents have branded a school "deplorable" for not telling them a five-year-old pupil had taken knives on to the site. They say they were only made aware the knives had been taken into St Joseph's Catholic Academy, in Leicester, following media reports after it was tweeted by Leicestershire Police. School bosses said the issue was handled "within the school". Police said the boy had been spoken to but declined to comment on the tweet. It is believed the child took the knives from a washing up bowl without his parents' knowledge. They remained in the boy's bag until they were discovered by another pupil. Families outside the school told the BBC it was "ridiculous" and "shocking" that they had not been told the details. One parent said: "I know nothing about this, it's deplorable isn't it? A real surprise. "It's really bad, we have had nothing from the school to say someone has done this, I have heard nothing at all." However, school spokesman Tim Empson said existing procedures, which included notifying the Leicester Safeguarding Team, had been used when the knives were discovered. Mr Empson said the knives had not been removed from the bag and inquiries had shown no child protection issues. "To avoid the child being stigmatised in any way, they elected to keep the situation within the school," he said. "While there is understandable concern from parents, there is a balance with the protection of the child." The school said it has adjusted its procedures so that pupils now do not have access to their bags during the school day. 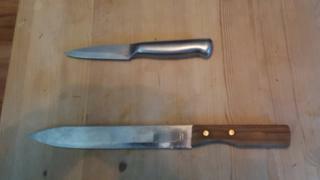 Mr Empson added the school would be speaking to police over the decision to tweet a picture of the knives.